Day Nineteen: Monday: Boy Alive! –	What significance would it have been to the widow if her son had not been raised? Think about the culture at the time. Who would she have had to care for her? –	Would you have been afraid to see someone sit up out of a coffin? –	Paint a picture of the story. Add this to your Lenten artwork. –	What did the story of the debtors have to do with the woman and the Pharisee? –	Was there significance in the act of washing Jesus’s feet? –	Who can forgive sins? –	Foot Washin’! Gather your supplies. If you have one of those pedicure tubs, pull it out! Or just grab a basin and some water. Grab some oils, lotions, whatever you have. Spare no expense. Wash the feet of those in your family. You can either do all of them. Mom and Dad can wash all feet together. Or you can all take turns. –	Alternatively: Make a luxurious bubble bath for each member of the family. Go overboard on bubbles, lotions, and fabulous bath goodness. The goal is to make everyone feel loved through pampering. –	Do you find that faith calms your fears? –	Have you ever felt the awe the disciples felt in your walk with Jesus? That “who is this that the wind and sea obey him” kind of feeling? –	Storm in A Bottle: You’ll need a clear bottler jar, water, vegetable oil, food coloring (blue is the most “sea” like, but you could do any color), glitter is optional. Fill your water or jar half way with oil. Drop in a few drops of food coloring. Add glitter if you are adding it. Fill the rest of the way with water. Add lid. Shake it around to mix the water and food coloring. Now, you can make a storm in the bottle! Rock it back and forth to make waves. Spin it in circles to make whirlwinds. –	Do you find it interesting that the demons recognized Jesus as the Son of God? –	We see demon possession in the Bible, yet we don’t hear much about it today. Do you think this is still something that happens? Does this give a new real ness to the term “spiritual warfare”? –	Jesus did something good for these men. Why do the people in the city beg Jesus to leave? 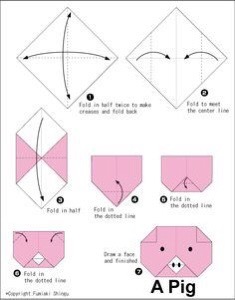 –	Make an Origami Pig! Origami is paper folding. It may take some practice to get the shapes right, but I am sure you’ll get it with practice. –	Do you think Jesus was tempted to be mad that all these people were following Him when He was trying to be alone? –	How many people would you guess were really there? –	What do you think they did with the leftovers? –	What’s for Dinner? Fish & Bread! Yep. Put that one the menu for dinner tonight. See what they think. –	Fish and Loaves Craft: You will need construction paper, glue, and glitter. Each person will need to cut out 5 loaves of bread from brown construction paper. With another color construction paper, you’ll cut out two fish. Use the glue to draw some lovely scales on the fish. Sprinkle with glitter. Glue all to a backdrop piece of construction paper. 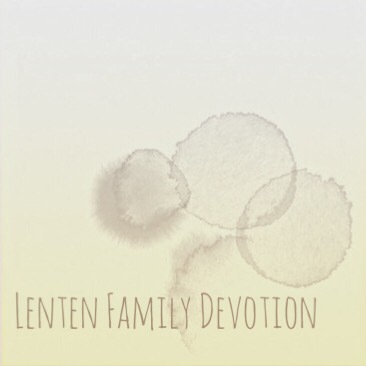 Add to Lenten artwork! –	The disciples had seen many miracles, why would they think “ghost” before “Jesus”? –	Discuss the boldness of Peter to even think to step out of the boat. –	Why did none of the other disciples try to walk on water? –	Do you ever feel like you are sinking and need to focus your eyes back on Jesus? –	Walking on Water Snack: You’ll need blue jello, whip cream (or cool whip), and teddy Grahams (or Annie Bunny, whatever you use in your house). Make everyone a cup of blue Jello. Let it sit. Before you serve, add whip cream to the top, prop up two teddy grahams on the top of the whip cream! Enjoy.